It seems that Sabang Regency never fails to attract tourists. Why is that? Aside from beautiful beaches and natural attractions, the region even owns interesting historical places for tourists to explore. For instance, it is Anoi Itam Japanese Fortress located in Sukajaya Sub-District. To be exact, the fortress resides in Ujong Kareung Village and it has been there since 1942! That means the building became the part of history during the reign of Nippon in Indonesia. 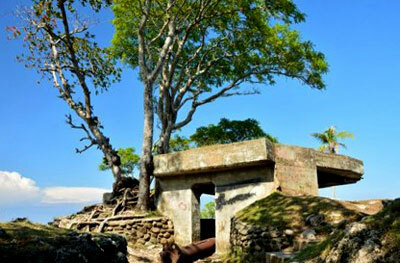 At the time, the Japanese Army built the fortress to store weapons and a hideout during the World War II. Today, it becomes a new allure for everyone including the locals and tourists. The unique thing about Anoi Itam Fortress is that it is built underground. On the surface, visitors can see the entrance that looks like a horseshoe though. In the past, the Japanese Army may guard the entrance and monitor whether there were any enemies nearby or not. What is inside? The nuance is definitely dark! It is also said the fortress connects to other fortresses that reside near to the location. However, the government decided to shut such connection in order to avoid any misuses. Here is another good thing. The fortress is located near to the beach, so visitors can witness sea scenery well from the site. Why is the name? As tourists may expect, the fortress resides near to Anoi Itam Beach. However, it takes a short trekking to reach the site as it is located on a hill. Have no worries. Tourists can use the stairs to get there. Once reaching the location, they may see the entrance (which looks old and creepy). On the horizon, the stunning view of the sea awaits them! Due to the strategic location, visitors can enjoy beautiful natural scenery there! The views of lush trees and hilly areas never fail to impress everyone after all. Many tourists even take the opportunity to do photography before entering the fortress. Once enjoying the scenery, they can do the prime activity which is caving. The entrance of the fortress is quite small, though. The condition even looks fragile due to the old age. Before going home, tourists should take the time to visit the nearby public bath located behind the fortress. Some good spots for relaxing are also available there, so visitors can enjoy recreation and rest for a while before going back to the hotel. Even some locals are also seen eating “Rujak” with friends or families! One thing, visitors should have prepared the foods beforehand as no food vendors are available. Anoi Itam Fortress is located near to Sabang City, so it won’t take much time to get there. The distance is only 4.8 km, so the trip may take about 10 minutes! Tourists can even get there faster if they take Yos Sudarso and Maemun Saleh Street, in fact.